3 Bedroom Southwest Style Home w/ Guest House on 7.7 acres of natural desert horse property set in a valley along a dry/annual perennial wash. Built w/Queen Creek Burnt Adobe block keeps the home very comfy. La Pella windows throughout. Kitchen features granite counter tops, Island & large farm sink. Dining is open to living room & Living room features rock fireplace with built-in heating vents above and on its sides to heat efficiently w/ scenic views of pool & surrounding Mountains. There are wood tongue & groove ceilings throughout home. Main house is a 3 bedroom - 2 bath or a 2 bedroom - 1 bath with a complete adjoining mother-in-law suite w/a full bath, full kitchen, bedroom with walk-in-closet, and small living room overlooking the private porch, property, and yonder mountains. Over all this home is a delight w/360 degree Mountain views & astounding sunrise/sunsets & an abundance of natural wildlife ,vegetation & privacy. 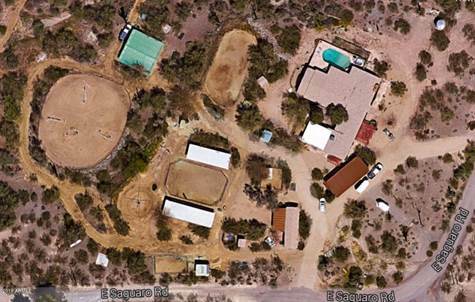 With the best riding and hiking trails in Cave Creek this property is an equestrian paradise offering tiered areas including 12 stalls, a hot walker arena, turn outs, covered wash racks, 2 sheds with hay cover. Lighted arena and a 6 mare motel connect to a trail which travels through the property. As a real ranch home property it is a work in progress and there's always room to be creative on this gorgeous serene property. All horse activity locations have running water and electricity. Walk-through laundry passes you through to a large separate family room. Adjoining this room is a small area that can serve as a small bedroom, office, or storage area. Additionally, there is a complete separate *GUEST* quarters adjoined by a covered walk way. Currently set up with commercial kitchen fixtures, it has a nice sized living area. Full bath and bedroom with a covered porch over hang. Parking features a new covered and ground treated 5 car carport. Also separate garage with connecting tack room and grooming area.